Nineteenth-century British imperial expansion dramatically shaped today‘s globalised world. Imperialism encouraged millions of people to migrate and forced millions to move. It shifted flora, fauna, and commodities around the world and led to a series of radical environmental changes never before experienced in history. 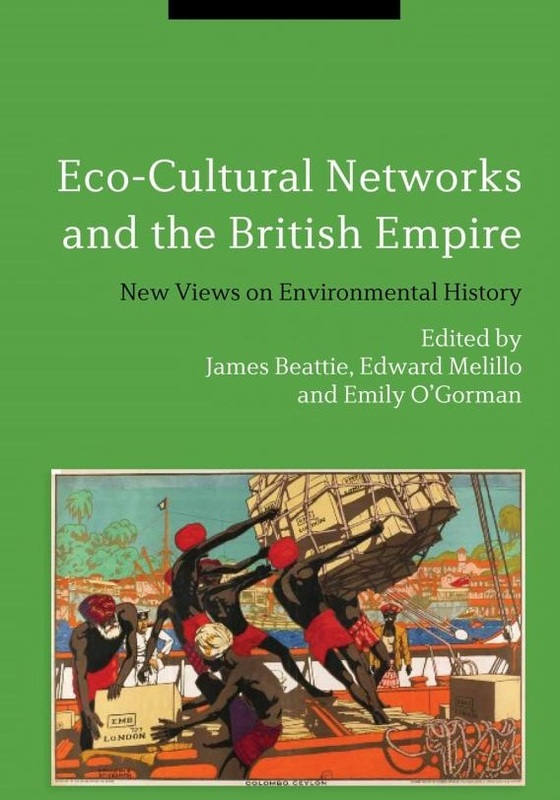 The recently published edited volume, Eco-Cultural Networks in the British Empire: New Views on Environmental History (Bloomsbury, 2015) explores how these networks shaped ecosystems, cultures, and societies throughout and beyond the British Empire, and how they were themselves transformed by local and regional conditions. Eco-Cultural Networks examines the pathways of trade, conquest, and governance that facilitated transfers of ideas, organisms, and commodities throughout Britain’s imperial territories from the 1830s to the 1950s. We use the concept of ‘eco-cultural networks’ to refer to these processes and to highlight the deep dependencies between societies and their environments. We contend that these dynamic relations and their characteristics cannot be understood in isolation and that British imperial expansion profoundly reordered landscapes and human societies. We also claim that the interconnected experiences of empire inspired the production of new ways of understanding and using environments, and that these produced a series of intended and unintended consequences with far reaching implications for the Earth and its inhabitants. A tremendous variety of individuals, institutions, and organisms participated in these eco-cultural networks, from working-class consumers in London to tea pickers in Sri Lanka, from merchants and markets in New Zealand and China to indigenous hunters in North America, and from birds migrating between Europe and Africa to British administrators in East Africa. In addition to bringing diverse cultures into contact, these imperial networks drew together far-flung places in new and unexpected ways. For British imperialists and imperial subjects, colonial environments throughout the world generated possibilities and restrictions, hopes and anxieties. New diseases and unfamiliar climates, challenging topographies and unknown biota, as well as cultural complexities and entrenched local resistance, frequently compromised the colonial project of dominance. At the same time, newly introduced plants and animals performed differently in various colonial contexts, often complicating attempts at acclimatization and frustrating efforts at commodity production. Because of its immense spatial extent, its ecological diversity, and its administrative and cultural heterogeneity, the British Empire presents a complex subject to analyse. However, as Eco-Cultural Networks demonstrates, the Empire’s vast scope provides historians with unique possibilities for seeing exchanges and relationships that operated beyond the political-administrative borders of nation-states and territories, or the boundaries of more localised regions. This book expands both the geographical and conceptual frameworks of imperial studies. Instead of cleaving to ethnic and national boundaries as traditional histories of the British Empire have, our book examines trans-regional connectivity, regardless of settlement type, to present new perspectives on both global environmental history and the history of the British Empire. A focus on imperial eco-cultural networks shows that the empire’s territorial boundaries did not circumscribe its environmental, political, or social impacts. Fundamental to the concept ‘eco-cultural’ is our recognition of the simultaneous production of knowledge about environments with their material exploitation under imperial regimes. It is no accident that disciplines such as botany and ecology emerged in concert with economic concerns about finding more efficient ways of using nature. [v] Botanic gardens and their scientists were central to the development of economic botany, facilitating far-reaching exchanges of commodity crops, among many other transfers. Anglo ideologies of improvement stressed the appropriation of lands from local residents and the transformation of imperial environments into sources of economic and moral value. European private property regimes conferred ownership rights, provided food sources, and opened new frontiers of commodity production. Environmental change, meanwhile, satisfied Biblical injunctions for settlers to cultivate and re-stock the earth. Such attitudes were enacted with various levels of success through military power and coercion, complemented by bureaucracies and legal frameworks, but also by other means, such as expanding banking systems, which mobilised capital for imperial projects of environmental change. Eco-Cultural Networks is divided into two sections, which use different geographical scales to examine British imperial eco-cultural networks. The chapters in ‘Part 1: Regional Perspectives on Networks of Exchange and Ecological Imperialism’ (Chapters 1 to 5) considers regional networks, many focusing on interactions among distant parts of the British Empire and beyond. In ‘Part 2: Local Cultural Networks of Exchange’ (Chapters 6 to 11), the authors examine networks from more localised vantage points, tracing the ways these assemblages shaped the cultural and physical landscapes of a particular place or places. [i] For a critique, see: Matthew W. Klingle, “Spaces of Consumption in Environmental History,” History and Theory 42 (2003): 94-110. A notable exception is John M. MacKenzie’s work, which gives equal weight to social and material factors in the imperial project. [ii] Péter Szabó and Radim Hédl, “Advancing the Integration of History and Ecology for Conservation,” Conservation Biology 25 (2011): 680-87. [iii] J.R. McNeill, “Observations on the Nature and Culture of Environmental History,” History and Theory 42 (2003): 5-43. [v] Note, for example, Ecology and Empire: Environmental History of Settler Societies, ed. Tom Griffiths and Libby Robin (Edinburgh: Keele University Press, 1997). [vi] Beattie, Empire and Environmental Anxiety, 1800-1920: Health, Science, Art and Conservation in South Asia and Australasia (Basingstoke: Palgrave Macmillan, 2011).